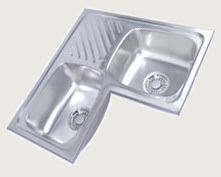 HI-FI Designer Kitchen Sinks suitable for Modular Kitchens. We are second to none in the Country as our sales net work has spread over the entire region. Also India?s First-ever Sinks Studio of ?FUTURA?displaying more than 60 models is housed at Bangalore which attracts many. Behind our great success lies the strength of our highlyqualified and a professional team in the Technical frontduly supported by the latest plant, machineries,R & D facilities etc., situated in an area of 35000 Sft.